There is a well-known scenic drive along the south-west tip of Africa named Chapman’s Peak Drive. Every piece of literature we read about Cape Town before visiting there reminded us that this was a *must do* for any tourist with a car. Even with all the hype (and maybe a little because of all the hype) we weren’t planning on doing the drive. Although we had ten days for our Cape Town vacation, we had a lot of things to check off our list, including Hermanus, Cape Agulhas, shark cage diving, Robben Island, and penguins, penguins, penguins! 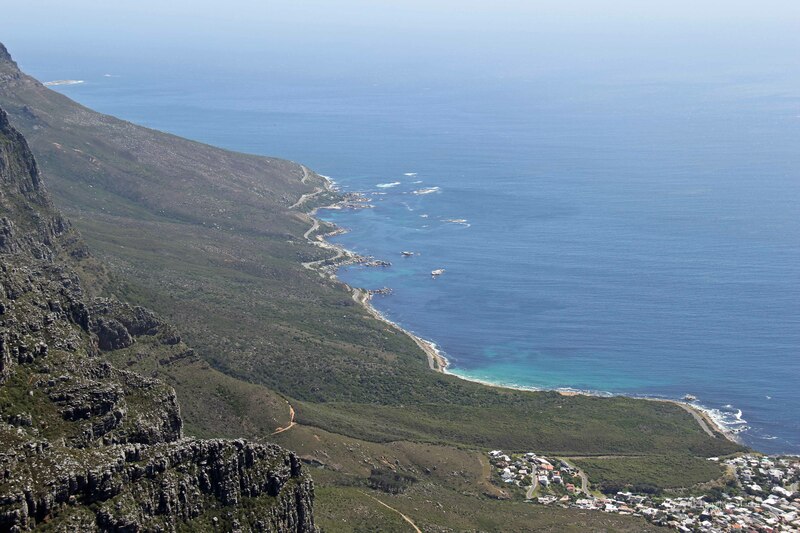 But as we stood atop Table Mountain after hiking up Platteklip Gorge, our guide very quietly directed us to look toward the ocean below and the idyllic winding road that is Chapman’s Peak Drive. “It’s on your way back to Simon’s Town, and it’s really is stunning.” It did look inviting. She told us how to get there and we parted ways. “What do you think?” I asked Kurt. We were both exhausted from our climb, and were eager to get some food and get down off the mountain. “Well, if it’s in the direction we’re already planning to go, why not?” He shrugged. We took another look at the ocean, the winding road, and the sweeping Cape, and got on the aerial cable back down the mountain. Looking down from Table Mountain. We got underway, and after a brief “emergency” stop for me to remove a Platteklip Gorge tick that had hitched a ride on my leg, we headed up the toll road. It really was stunning. We liked it so much that we returned twice on our vacation, including one evening to grab a pizza from a popular local restaurant and take it to eat while watching the setting sun over Hout Bay and the Atlantic Ocean. Yes, Chapman’s Peak Drive is a Cape Town *must* do.To plan your own trip or to read more about Chapman’s Peak Drive, I recommend starting with this great website: Chapman’s Peak Drive. Here are a few photos from our first and second drives. I’ll share sunset with you another day. LOVE that drive! Great pics & glad you got rid of the tick. ;-)- Oh, how I wish I were there. Those are some really nice pics. The roadway with its rock cut passageways etc. looks familiar…I wonder if that drive has ever been featured in any films?? Thinking like one of the newer Bond films maybe?